Vergina (UNESCO World Heritage Site) and Pella deserve to be on the itinerary of everyone who comes to visit the northern part of Greece. Unjustly, Lonely Planet dedicates only half a page to both of those places, which I intend to correct. Not only are Vergina and Pella rich in historical heritage and archeological sites, but also they have names of Philip II and Alexander the Great written all over them. 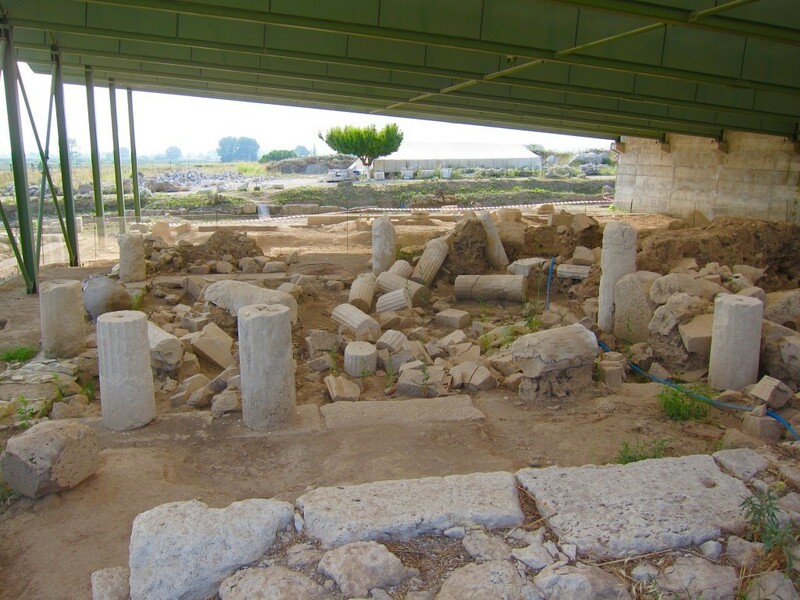 Welcome to the ancient (Vergina) and slightly younger (Pella) capitals of Macedonia! It is a long day trip (700 km) from Ioannina, so we left town shortly after breakfast, while D’s family was packing their bags to drive to the beach. 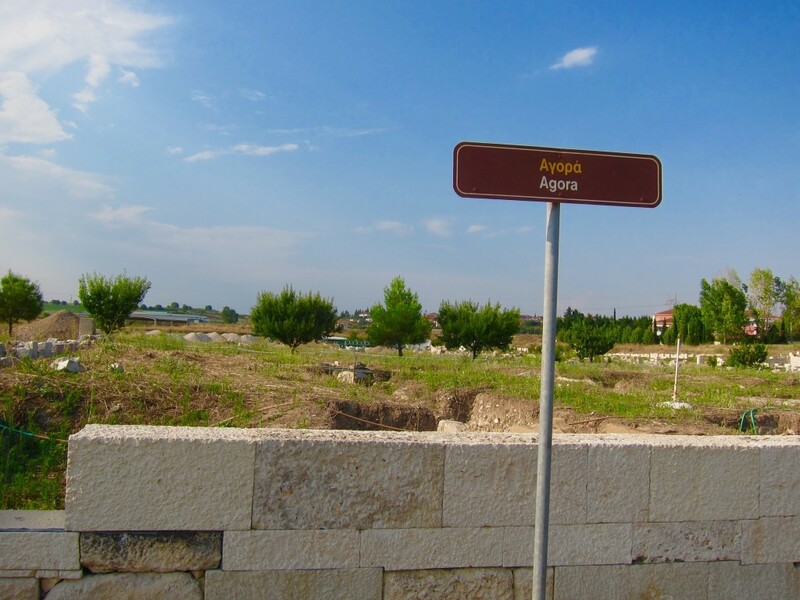 Modern village of Vergina lies pretty much on the same spot where the ancient town of Aigai (or Aegae) was. During the 8th and 7th century BC this area was ruled by Illyrian tribes. 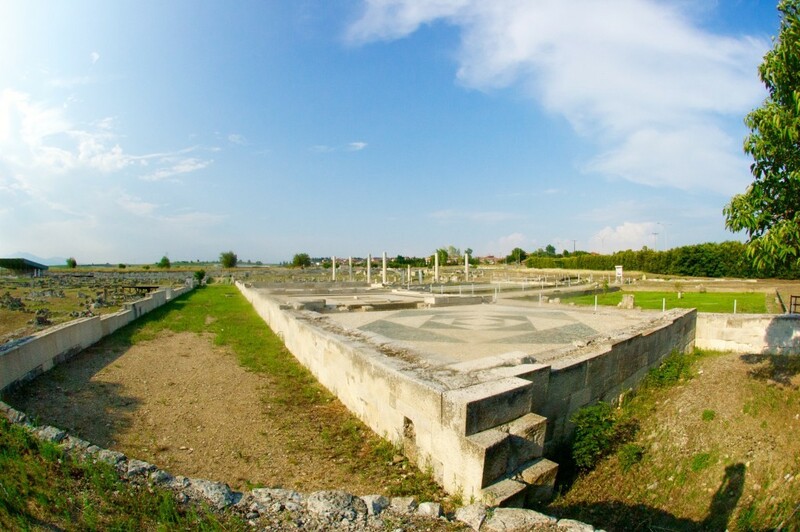 The Argeads, an ancient Macedonian royal house led by Perdiccas I, fled from Argos in approximately 650 BC, expelled Illyrans and established their capital at Aigai. It wasn’t a random move, as the Oracle of Delphi prophesied Perdiccas I to build his capital city “where goats led him”, which was exactly in Aegae – “city of goats”. From Aigai the Macedonians began their predatory activities, subjugating to their realm Pietria to the southeast, Bottiaea to the northwest and Mygdoni to the north. When King Archelaos transferred the capital to Pella, in the late 5th century BC, Aigei lost none of its significance. It retained its role as the royal burial ground and received the members of the royal family on the special occasions, such as weddings and funerals, when custom decreed their presence in the old capital. For this reason it was here that Philip II was attending the wedding of his daughter Cleopatra to King Alexander of Epirus when he was murdered in the theatre. Philip’s son, young Alexander the Great, who was immediately declared the King of Macedon, fulfilled his filial obligation by throwing the most lavish funeral ceremony of historic times held in Greece. Laid on an elaborate gold and ivory deathbed wearing his precious golden oak wreath, the king Philip II was surrendered, like a new Hercules, to the funeral pyre. Alexander’s death adversely affected the city and in 276 BC the Gauls of Pyrrhus plundered many of the tombs. After the overthrow of the Macedonian kingdom by the Romans in 168 BC both old and new capitals were destroyed, the walls pulled down and the palace, theatre and all other buildings burnt down. In the 1st century AD a landslide completely destroyed the city, however, some parts still remained inhabited. Between the 2nd – 5th centuries AD the population progressively moved out, and all that remained was a small settlement whose name, Palatitsia (palace), was the only indication of its former importance. The knowledge and importance of Aigia weren’t loss with time, as many excavations took place here between 1850s and present day. However, it was not till 1977, when the Great Tumulus (mud hill), 13 m high and 100 m in diameter, was discovered by Manolis Andronikos and his team. It contained 4 royal tombs, two of which (II and III) were not looted. Tomb II was proven to belong to Philip II and his wife and Tomb III to Alexander IV, a 14 year old son of Alexander the Great with his wife Roxana. 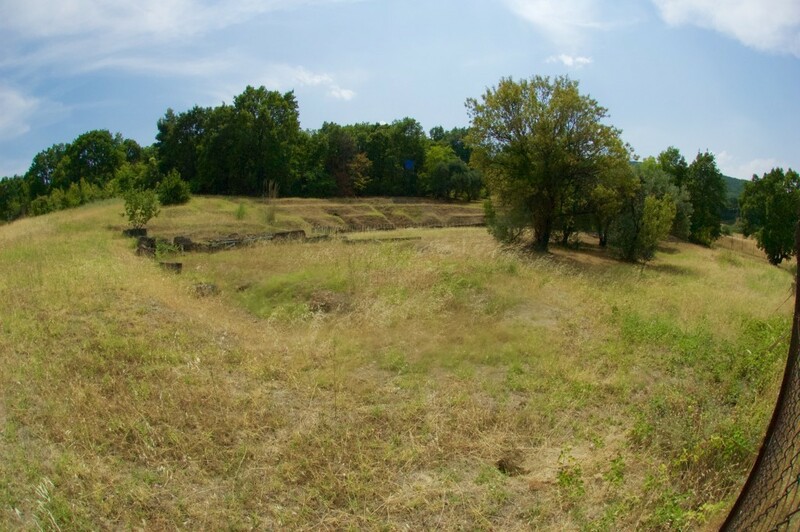 Besides the Tumulus, the wider archeological site of ancient city was also excavated in Vergina. It contains an impressive palace and the theater where Philip II was assassinated, Sanctuaries of Eukleia and the Mother of the Gods, agora and eleven Macedonian tombs, the extensive prehistorical tumuli cemetery, the Archaic tombs with rich grave goods and the funerary dedicatory inscriptions of Classical and Hellenistic time. We were set for another archeological adventure. Legend: (1) The Palace, (2) The Theater, (3) The Sanctuary of Eykleia, (4) Public buildings, (5) The Rhomaios Tomb, (6) The Hellenistic house, (7) The Sanctuary of the Mother of the Gods, (8) The Great Tumulus, (9) The Tumuli cemetery, (10) The Tombs of the Bellas farm, (11) The Acropolis. We naturally began at the Great Tumulus or The Royal Tombs, as it’s called (p.8 on the map). As I have already mentioned earlier, the Tumulus was discovered in 1977 and the excavations weren’t complete till the 1990s. 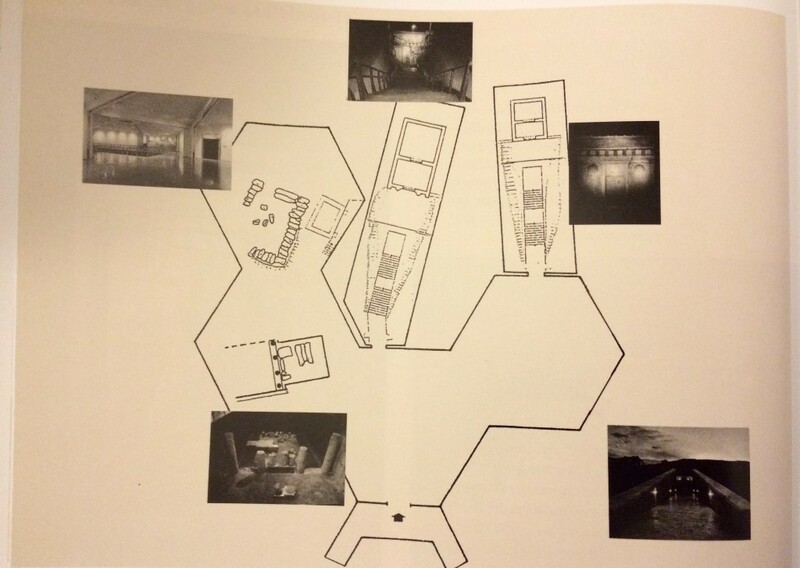 In 1992, to preserve the site just as it was, museum was built in a form of a large protective shelter in shape and form resembling the original Tumulus with all 4 tombs inside. And today, when you enter the Museum, you walk underneath of the mud hill, equipped with electronic systems and climate control, that literally surrounds the monuments. Entry €8, photos and videos are strictly prohibited. I really loved the museum for its likeness to the original mud-hill hosting the cluster of tombs…. oh wait…. it was the original mud-hill! This very clever and orderly exhibition on its own was worth a trip to Greece. The treasures are displayed besides the tombs that contained them, but nothing is as it once was. The modern shell continues to mark the site and protect the tombs, recalling the image of the Great Tumulus but essentially revoking its function, since it is designed to make the monuments accessible to the public, while the ancient tumulus concealed and isolated the houses of the dead from the living. Death transubstantiates. Whatever “died’ and was buried, following the deceased to his/her grave, whatever for centuries has been locked in earth’s embrace may perhaps one day return to daylight but it will never be the same as it was. Raised on their pedestals, the objects, no longer usable but nevertheless useful, become monuments, fragments of memory, ideas rather than material objects. The finds are conserved, “restored” and exhibited to the public, totally estranged from the original function. The exhibition method is bound to respect their form and character, but it can’t avoid expressing the aesthetics of contemporary viewers, whose ideological needs it addresses. In light of these considerations, minimal, timeless forms and modern, neutral materials of the strictest specifications – metal, crystal, dull aluminum, synthetic glass – were chosen. The finest that modern technology has to offer in the field of museography – hermetically sealed, individually climate-controlled metal showcases, optical fibers, metal sound-absorbent panels, electronic control systems – was enlisted to ensure the optimum conditions for protection and ongoing preservation of the site. And all these was done without losing the atmospheric element in a museum, which intends to address both mind and emotions. Guided by the expression “excavations brought to light” the curators knew that death and oblivion were equivalent to “shadow and the absence of color”, while life and memory correspond to “light and color”. Modern construction enveloped in tones of grey are lost in the dimness; thus was created a world of shadows, where the ancient objects, shining and warm, reign supreme, and where apart from the monuments the only color of royal purple, an allusion to the blood of the royal deceased who haunt the place like the heroes of an ancient tragedy. The area in the museum was broken up into multiple spaces, creating the element of surprise that accompanies every visitor and ignites her/his interest. The darkness that reigns in the museum arouses awe and turns voices into whispers, suggesting the atmosphere in the land of the dead, which it still is. The skein of memory unwinds in the museum through the prescribed course and the sequence of thematic units. At the entrance, the picture of the Great Tumulus and its three-dimensional model provide an overall impression of the site and its monuments. The first unit is devoted to the Macedonians whose grave stones were found in the fill of the Great Tumulus. Immediately following these are the ruins of the Macedonian Tomb (IV), that may have belonged to Antigonus II Gonatas, with its four free-standing Doric columns, a monument built in the Early Hellenistic age (300 BC) on the edge of the Royal Tumulus. It was uncovered in 1980 already badly destroyed, however, it was once richly furnished based on the few but impressive finds – ivory heads etc. Next is the “heroon”, an above-ground monument dedicated to the cult of the distinguished dead, and besides it is the cist tomb (I) of one of Philip’s seven wives, perhaps Nicesipolis of Pherae. Here, pay attention to the frescoes that decorate the tomb’s walls, outstanding among them is the scene of the Abduction of Persephone (Kore) by god of the Underworld. The three Moirai, inaccessible and impartial mistresses of fate, the mute pain of Demeter, the mother who though a goddess could not save her daughter from the hands of Hades, the fear in the eyes of the nymph who becomes a witness to the abduction of the defenseless Kore by the Lord of Death, all would initiate you into the mysteries of the Underworld. Then well-prepared, you will arrive at the units devoted to Philip II, the king whose actions changed the course of Hellenism. In the first area you can see king’s weapons, the utensils employed in his funeral ceremony, the symbols of his authority and the precious bronze household vessels employed for his final bath. The chryselephantine bier was embellished with an ivory relief frieze, an exceptional work of miniature carving. Immediately after, you can descend the “dromos” of Philip’s tomb and admire the 5.60 m long frescoes depicting the royal hunt, a work with nothing to envy the creation of the great Renaissance masters. In the antechamber is another burial of a young woman, possible Philip’s wife, Cleopatra Eurydice or Meda of Odessos, who by tradition sacrificed herself at the funeral. Her bones were wrapped in cloth of gold and deposited in a gold larnax. Another chryselephantine bier completed the rich furnishing of the tomb, while the precious gold wreaths and diadems bear witness to the inordinate wealth of the dead. The museum was virtually empty and when I descended to the bottom of the tomb, there was this aery feeling that I wasn’t alone, but in fact I was! I am not a strong believer in ghosts and extraterrestrials, but I swear, there was something “strange” about this tomb. The next stop is the showcase with the remains of the funerary pyre that were found thrown on the vaults of the tomb, irrefutable evidence of the deceased’s identity. Pay attention to the large gold larnax found inside the marble sarcophagus inside the tomb. The dead king’s bones were places in the precious casket after the cremation. The lid is decorated with the large sixteen-rayed star (Vergina Sun symbol), while on the sides are bands of lily, palmette and rosette ornaments. Then, we proceed to the heart of the exhibition, devoted to the heroized Philip II. Here, among the gold chests and wreaths, the splendid symposium utensils and the precious gold and ivory banquet couches, stands as a trophy to memory his “resurrected” gold-trimmed armor. Worthy of an Achilles this armor, perhaps that which Philip wore when he was proclaimed leader of all the Greeks, is marking with the sheen of gold and ivory the shape of his absence. It is a pretty remarkable tomb and a collection of items, considering that the funeral was done in a rush. The following Prince’s Tomb (#III) is devoted to Alexander IV, the son of Alexander the Great who met a premature death, and who was buried in the shadow of his glorious forebear after 310 BC. The tomb was untouched by the looters, Alexander’s IV bones were kept in a silver urn (hydria), crowned by a gold wreath and placed upon a stone podium. A narrow frieze with a subject of a chariot race, painted in lovely colors, decorates the interior walls of the antechamber. The exhibition closes where it began, with a series of grave stones and the pictures of Manolis Andronikos, a man who brought the treasures to light. On the map that I attached earlier, there are many more archeological sites in Vergina, some of them, like Palace and the Ancient Theater, are accessible to visitors and most are not. Using the map, we drove to all of them but unfortunately, both, palace and theater were fenced out and closed. 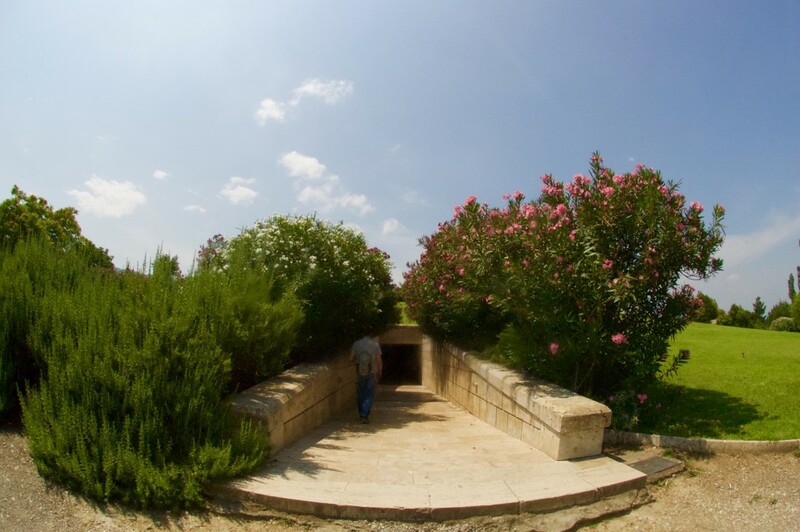 However, for those who are planning to visit Vergina I would mention a few interesting facts about some of its sites. The Palace of Vergina (p.1) is a large urban complex that includes the theater, the agora with the Sanctuary of Eukleia and perhaps other buildings. It was the first monument recognized in the area in the mid 19th century and it occupies an area of about 1 ha (104.5 m by 88.50 m). The architecture of the palace essentially reproduces that of the ancient Greek house with the central peristyle court surrounded by four large Doric porticoes. On the south side are huge rooms – the formal halls of the palace where the famous Macedonian drinking parties (symposia) were held. Rooms on the west side served as luxury accommodations to not only the royal family but to their guests, friends and warriors. On the northern side of the palace ran a long veranda, a special feature unprecedented in the architecture of the Greek house, from where the king and his entourage could survey the city and plains as far as the eye could see. Walls and architectural members, all worked with stunning accuracy, were covered by the highest-quality marble stucco. Thousands of tiles and decorated antefixes of exceptionally fine quality, hundreds of square meters of marble inlays and mosaics, costly pigments, bronze and every kin on luxury material were enlisted to create a whole befitting the ruler’s ambition. Interestingly, the Pythagorean golden triangle (3:4:5) and the enigmatic sequence of “Platonic” numbers (1,2,3,4,9,8,27) determined the alignments of the building, while the number (1.61), “the golden ratio” was the “common mean” holding together this fascinating structure, designed for a Pythagorean ruler. It was a building where nothing was left to chance, in which even the smallest detail obeyed the magic of harmony arising from the world of Pythagoras to inspire the golden rule. The palace is considered to be not only the biggest but also, together with the Parthenon, the most significant building of Classical Greece, it would become a model for all the palace complexes of the Hellenistic world and beyond. Recent archeological research has shown that the palace must have been built together with the theater in 359-336 BC. Some changes were made at the later days and it was finally abandoned in the 2nd century BC, when the Romans assumed sovereignty. The ancient theater (p.2) was discovered in 1982 at the base of the large palace terrace, which suggested that the two buildings were conceived as a single complex. That would also explain the odd choice of the site for the theater – its cavea facing north, rests against the hillside only on its east part. It meant that only the seats of the first row around the orchestra were of stone, while the rest were formed with the help of wooden bleachers, since there was no rock to support the construction. It was the place where the dramatic even of Philip’s II assassination on his daughter’s wedding day took place in 336 BC. The cemeteries (p.9) which span for a period of almost ten centuries and occupy the territory between the present villages of Palatitsia and Vergina. A large section to the east dates to the early centuries (10-7th century BC) when the kingdom of Macedon was taking shape. Over 300 prehistoric burial mounds (tumuli) have been found there. The centuries of the kingdom’s site and heyday (6th-4th century BC) are represented by rich and very important sepulchral monuments, the majority on the outskirts of modern-day Vergina. Large Archaic tombs as well as Early Classical Macedonian tombs from the 4th century BC create one of the major groups of monuments in Macedonia with their architecture, paintings and grave goods. The Early Iron Age sections of the cemetery have distinctive traits: each tumulus includes more than one burial (usually from 5-15), male and female, suggesting that it served a family. Many simple tombs as well as the late examples of Macedonian tombs date from Hellenistic times (3rd-2nd century BC) indicating the continuity of customs and of life in the city even when the kingdom was on the wane. Tombs from the period of Roman rule, after 150 BC, appear sporadically over a wide area among the earlier monuments, as well as further north to the river Aliakmon. The Tomb of Eurydike (near p.5) is the earliest known Macedonian tomb, built in 340 BC it was dedicated to a woman of a high rank, perhaps a queen (hence the name). It was plundered at some point in the past, however, the rich and impressive architectural details decorating the large room were completely preserved. Room also contained an unprecedented find: a richly embellished marble throne 2 m high, decorated with reliefs, gilded flowers and animals of all visible parts as well as with statuettes of korai. “Rhomaios Tomb” (p.5), dated to around 300 BC, was named after the archeologist who discovered it. This two-chambered subterranean building of harmonious proportions is framed by four elegant Ionic columns. Very little decoration is preserved, as it was looted at some point in the past, however, the impressive marble throne with a small marble footstool enhance the interior. In addition to the throne there is also a stone bench, which perhaps served as a base for the bier or the catafalque. The Macedonian Tombs on the Bella Farm (p.10) dating to the 3rd century BC. One day I will have to go back to Vergina and see all those sites with my own eyes, but we were on the way to see the second capital of Macedon Kingdom – Pella, which was about an hour drive. In the late 5th century BC, Archelaus I chose this coastal area as the new capital of Macedonian kingdom. It is hard to imagine but in antiquity, Pella was a strategic port connected to the Thermaic Gulf by a navigable inlet; the harbor and gulf have since silted up, leaving the site landlocked. At that time, its location ensured better communication with the rest of the Greek world both, via sea routes and by open plain. Another reason why Pella was chosen to be a new capital, was its continuous habitation from the Early Bronze Age. Archeological excavation in Pella uncovered several cemeteries of the Early and Middle Bronze Ages (3rd millennium BC), Iron Age (9th-7th century BC) and 6th-5th century BC, which along with the remains of pottery confirm the existence of older settlements, which the Macedonian capital succeeded on the same site. Just as Aigai, it wasn’t simply an administrative center – great painters (Zeuxis) and poets (Timotheus of Miletus) frequented the city. The Athenian playwright Euripides stage Bacchae here for the first time in 408 BC, and lived there writing and producing Archelaus. 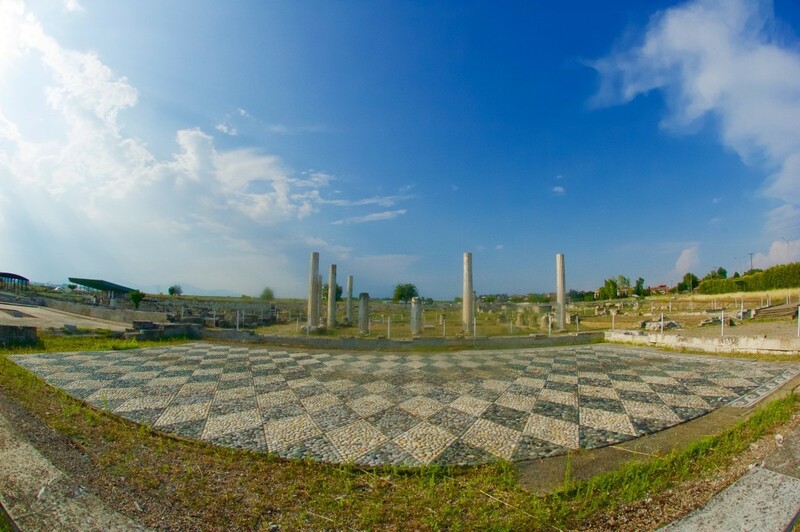 Pella was also the birthplace and seats of Philip II and of Alexander the Great, his son. 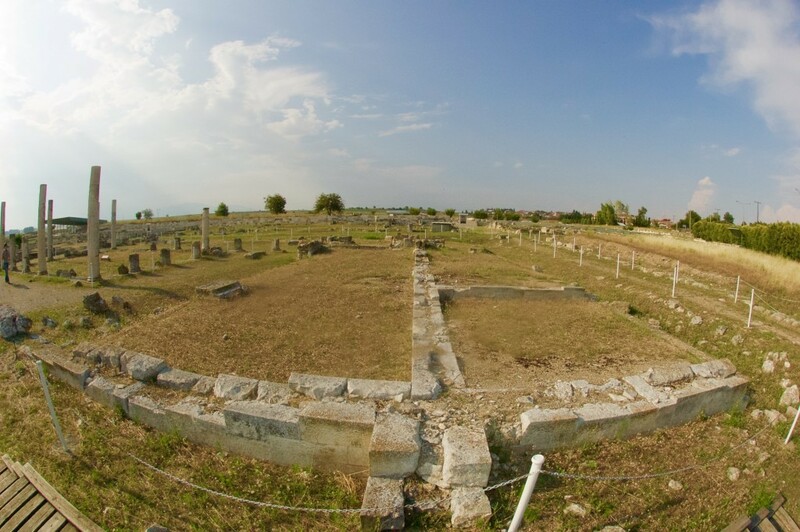 It became the largest and richest city in Macedonia and flourished particularly under Cassander and Antigonus rules, which can be concluded based on the richness of the archaeological remains of that period. In 168 BC, Romans took over the city, moving all its treasures to Rome. In about 90 BC the city was destroyed by an earthquake; shops and workshops dating from the catastrophe have been found with remains of their merchandise, though the city was eventually rebuilt over its ruins. Despite the city’s continuous decline, archaeology has shown that the southern part near the lagoon continued to be occupied until the 4th century AD. Modern-day Pella is a small sleepy village with a beautiful modern museum and an archeological site, just outside the city. W started our tour with the Archeological Museum of Pella as we were afraid it would soon close for visitors. Entry €6 for museum and the site. Pictures with no flash are allowed. Please allow 1 hour for your visit. 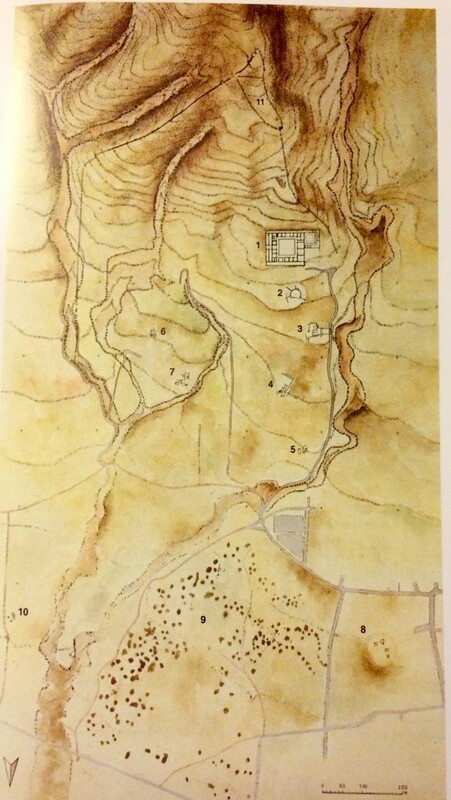 In the information section, texts, photographs, maps, drawings and a large model of the archeological site gave us the necessary information to become acquainted with Pella: the geomorphological evolution of the region, historical data concerning the city and excavations, its building system and fortifications. The city’s identity is confirmed by inscribed roof tiles with its name, while its historical periods are presented by a selections of coins from the excavations of various places, issues of both the Macedonian kings (from Alexander I to Perseus) and from the years following the Roman conquest of 168 BC. 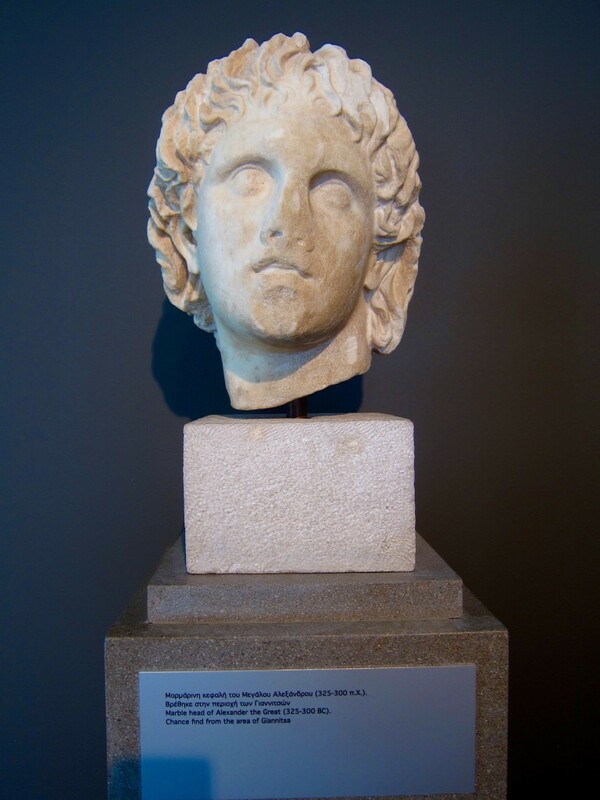 The very first two finds we encountered were both connected to Alexander the Great, who was born and grew to manhood in Pella: a marble head considered a portrait of Alexander III and a marble statuette depicting him with the characteristic attributed of the god Pan. The first thematic grouping of the main exhibition area concerns the daily life of Pella’s inhabitants. A reconstruction of a wooden door indicates the entrance to this exhibit. The main objects on display here are the mosaic floors from the Houses of Dionysus and of the Abduction of Helen, set in the floor, and the wall decoration from the so-called House of the Wall Plasters, restored in polychrome plaster. The exhibit cases display excavation finds that provide a wealth of information about the structure and functions of the rooms in residences, their furnishings, the daily life of their residents, their clothing, personal adornment, occupations, education, amusement as well as rituals at household shrines. Architectural members and tiles, household outfitting and equipment, restorations of furniture (a banquet couch, a seat, etc) and models contribute to our understanding of the function of spaces and daily activities. The second thematic grouping has public life in Pella as its theme. 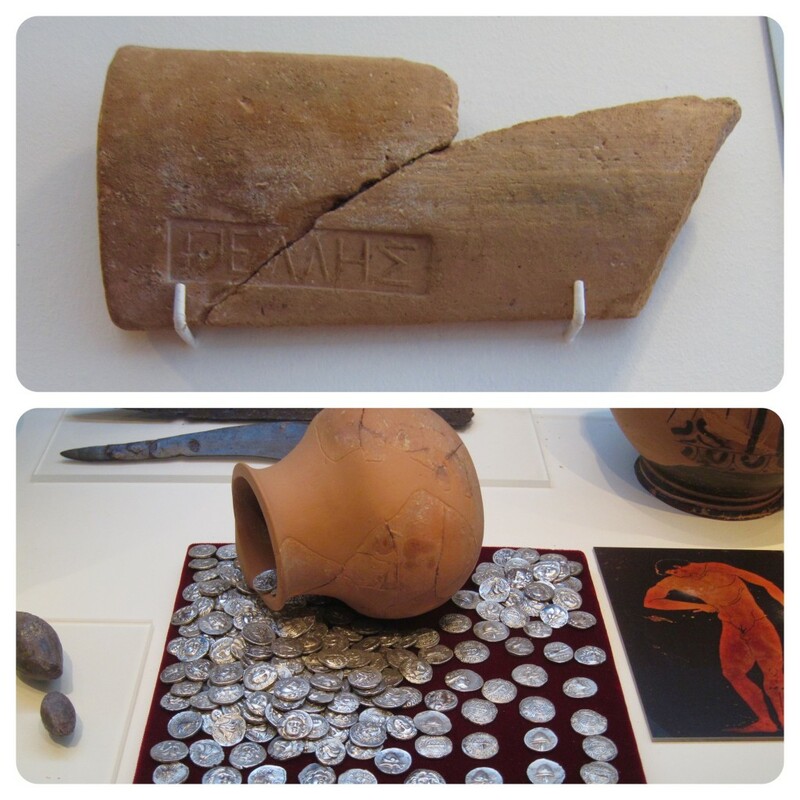 The finds on display come primarily from the Agora and are connected with administrative institutions (clay seals for public documents, inscriptions, coins, monumental sculpture), production and commercial activities (vases for storing and transporting wine, oil, etc, many with seals on their handles indicative of commercial exchange, vases for daily, symposium, and ritual use in a variety of shapes and with different types of decoration, moulds for the production of relief vessels, terracotta figurines and moulds for their construction, equipment from pottery and metalworking workshops and others). 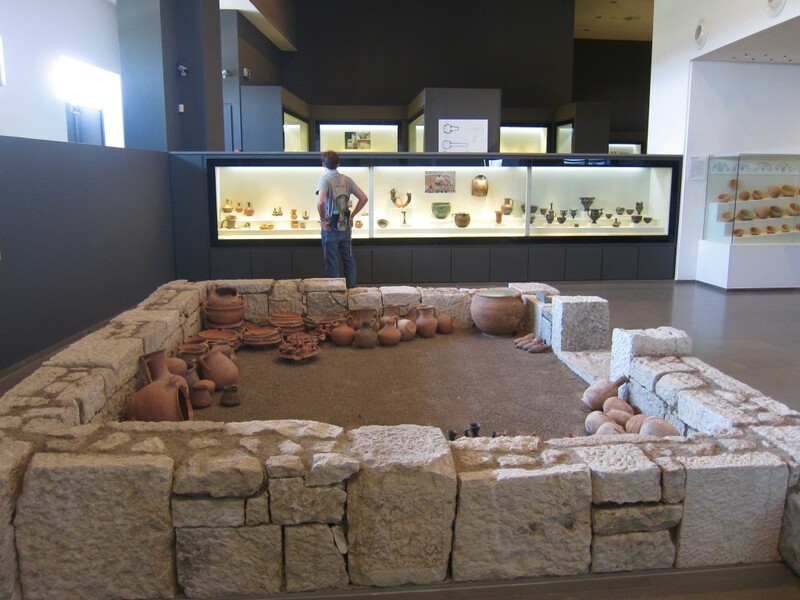 A model of Agora depicts the architectural form of the complex, and a restored pottery workshop and its finds as there were discovered during excavations, offer a clear picture of the production process. 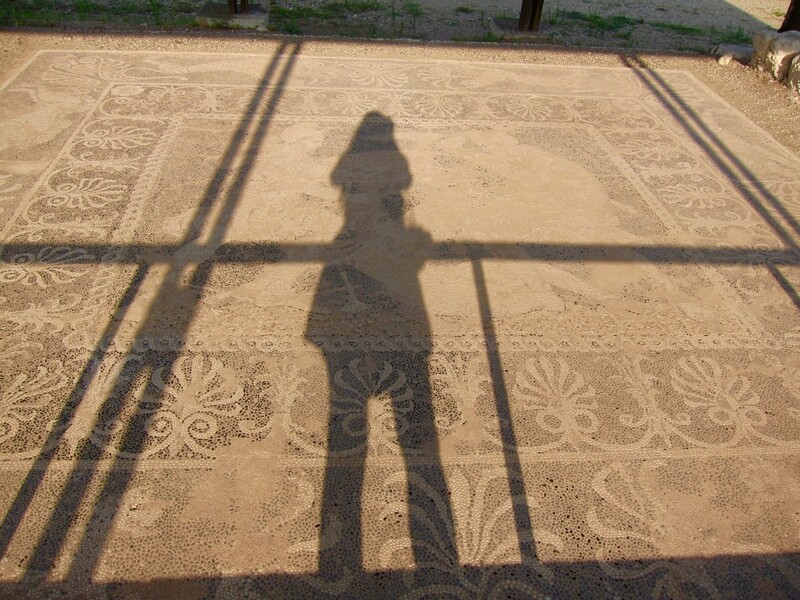 The third exhibit displays mosaic floors and finds from Pella’s sanctuaries, with information about the gods worshipped there and the organization of functions of religious buildings (the sanctuaries of Darron, the Mother of the Gods and Aphrodite, and the Thesmophorion). The fourth exhibit – the city’s cemetery, is the only one isolated from the others by virture of the particular nature of grave goods. 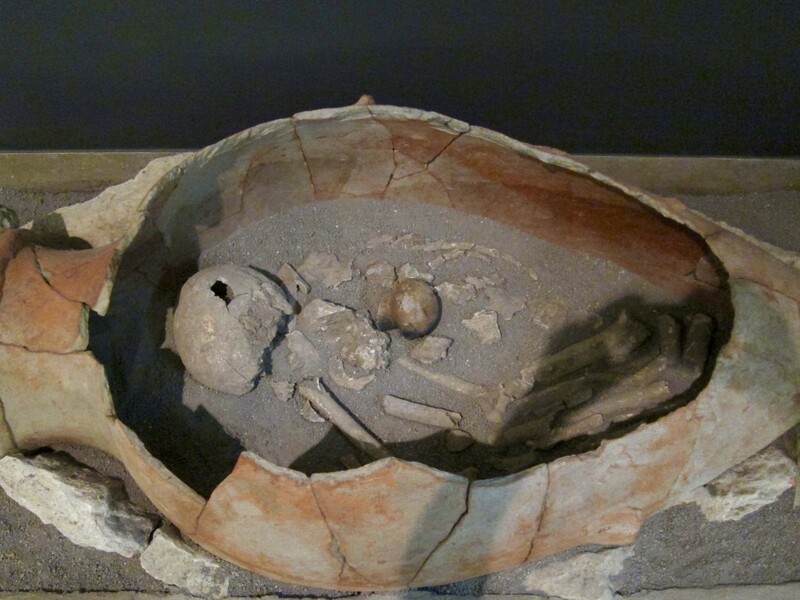 Here, two burials are on display together with their grave goods: a burial in a clay pithos of the Bronze Age, and a restored cist grave of the late 5th century BC. The display cases exhibit grave goods from Pella’s cemeteries, of the Bronze and Iron Age, Geometric and Archaic periods (9th-6th century BC), the Classic period (5th-4th century BC) and Hellenistic periods (3rd-2nd century BC), which provide a host of evidence about social structures, funeral customs, the language of residents (Doric Greek), and accomplishments in numerous artistic fields. From the cemetery exhibit, we ascended the ramp to conclude in the palace gallery. To the left, we could still see the previous exhibits, but to the right we could see the archeological site itself through small openings in the building’s walls. This exhibit offers evidence concerning the architectural form and functions of the complex, as well as the personality, life and works of Alexander the Great. From the balcony surrounding the entire space, there is an opportunity for a panoramic view of the museum. We left the museum hungry to see the site and… for food. 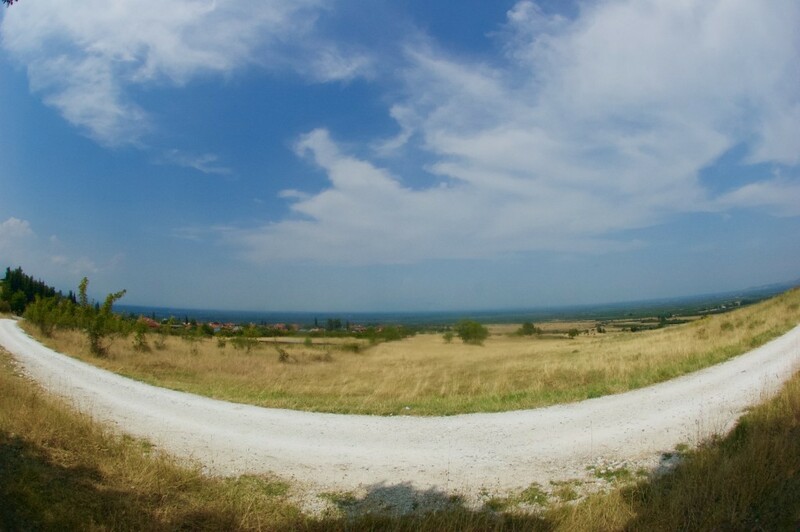 We drove back to the village and settled at the only place that seemed to be open – To Lemoni. 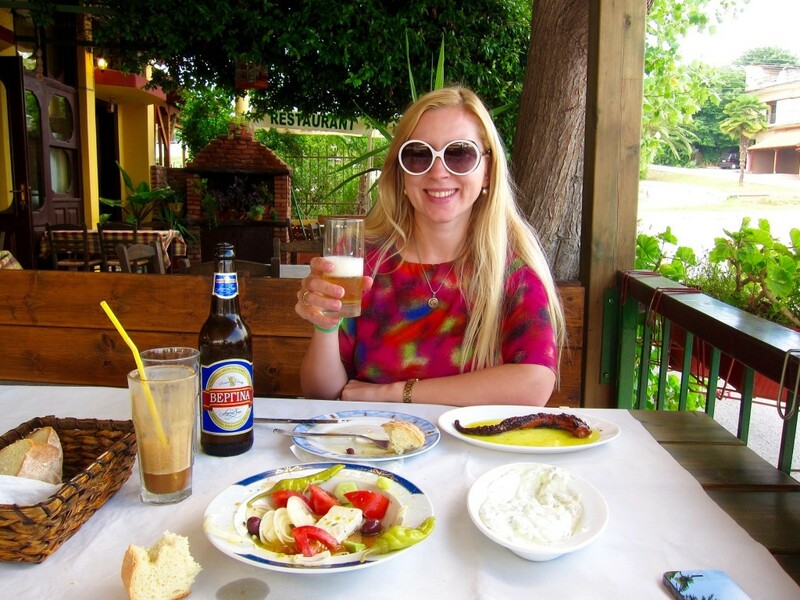 That was a perfect “lack of choice” as the place served the most delicious food I’ve tried in Greece. The restaurant was virtually empty and we suspected that the person who took our order might have as well cooked the food himself in the kitchen. Well-refueled, we continued to the main archaeological site. The oldest residential remains, discovered in the area of the complex belonging to the sanctuary of Darron, indicate with a high degree of probability the presence of a city plan with rectangular building blocks from the first half of the 4th century BC. The pronounced presence of imported Attic pottery confirms the close relations of Pella and Athens and this is further supported by the influence of Attic art noted in other fields as well, e.g sculpture, where Attic influences succeeded those of the islands of the coast of Ionia. In the second half of the 4th century BC, the growth of local pottery, terracotta, metalworking and mosaic floor workshops laid the basis for a flourishing production that continued until the city was abandoned following the earthquake of the 1st century BC. Roman province of Pella did not prevent its partial habitation, at least in its southern sections, where residential establishments of the Roman period (1st-4th century AD) have been discovered. The ancient city as we know it today with its grid-like city plan, not unlike the one of New York City, dating to the last quarter of the 4th century BC extended over an area of about 400 ha. Its lay-out, with rectangular building blocks of equal width uniformly separated by roads between 6-9 m wide, is impressive, as it is the most fully-developed seen in an ancient city of the Greek worlds; to have an idea of its size, it stretched over an area extending 2.5 km North-South, and about 1.5 km East-West. Pella Map. Some of its main roads were wider than others, and were paved and surrounded by sidewalks and colonnades, while beneath their roadbeds lay dense, well-organized water and drainage network. Rock-hewn tunnels carried water down from mountain springs; these ended in clay, stone or built pipes with manholes so that they could be cleaned! These, together with fountains and wells, all testify to the high standard of living enjoyed by residents. Areas for bathing have been found in many houses as well as in public structures. In one public bath near the site’s entrance, in use from the last quarter of the 4th until the late 2nd century BC, all the evolutionary phases of bathing installations in Greece are shown, including one of the earlier forms of underground heating. 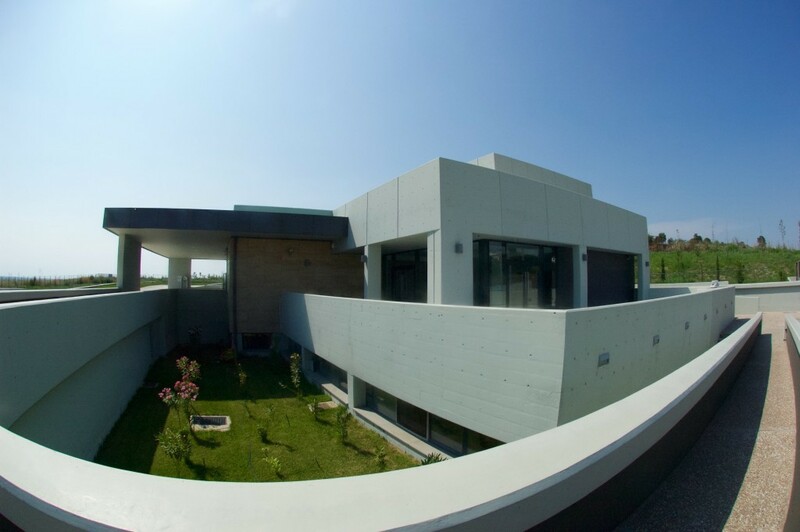 Private residences, the smallest between 150-200 sq.m. and the largest between 2,500-2,300 sq.m. in size, with central peristyle courtyards featuring Doric and Ionic architectural elements, banquet-rooms with floors elaborately decorated in natural mosaic tesserae, wall paintings with renderings of architectural elements that were later widely adopted in Italian cities (e.g. Pompeii, which gave its name to this particular style of decoration), small household shrines, the private apartments, ancillary and hygiene spaces all suggest an economically and culturally-flourishing society. The city had strong fortifications, from which sections of the north, west and east sides have been discovered. The palace of Pella occupied an area of 60,000 sq.m. and was comprised of five building units with large peristyle courtyards, reception and meeting rooms, spaces for worship, private apartments completed with baths, workshops and storerooms, as well as bathing installations incorporated into a large palaestra. In the heart of the city was the Agora, its large commercial and administrative center, which encompassed an area of 70,000 sq.m., occupying ten building blocks of the ancient city, with an enormous square in its center, at whose sides the city’s streets concluded with monumental terraced approaches; the square’s center was bisected along its East-West axis by the city’s largest street, 15 m in width. In the Agora there were organized workshops for making and selling pottery, terracotta figurines, and metal objects, as well as shops selling food, grain and meat, in addition to wine from many regions; there were even perfume shops. The north wing of the Agora formed the seat of local rulers, as it shown by its architectural form, monument base – a number of them bearing inscriptions – as well as parts of a sculptural composition found here. A two-storey building complex with peristyle courtyard in the southwest section of the Agora also had an administrative function; it comprises the city’s public archive given that public documents were stored on its second floor. It is shown by the large number of clay seals found solidified by the fire that destroyed the building. However, a variety of workshops was also found incorporated into building blocks outside the Agora in other areas of the city, thus confirming its prolific production and cottage industries, which continued even after the Roman conquest of 168 BC, and did not cease operation until the city was destroyed by earthquake. Two large organized sanctuaries were incorporated into the city’s grid plan, within building blocks but without any particular prominence or monumental character. There were the city’s urban sanctuaries, which shared common architectural elements: large outdoor spaces for gatherings of large numbers of people, small two-chambered shrines, banquet-rooms, storerooms, workshops, and courtyards to serve their various functions. In one, situated directly north of the Agora, the Mother of the Gods and Aphrodite were worshipped in their role as patron goddesses of the city and its inhabitants. In the other, in the southwest part of the city, there local healing god Darron, a divinity known only from Hesychius who is attested for the first time in inscription from Pella, was worshipped. Another sanctuary, the Thesmophorion, was investigated northeast of the city. It was a small circular outdoor rural sanctuary, where the patron goddess of agriculture Demeter and other divinities connected with the fertility of earth and human beings were worshipped. It is an incredible and very peaceful site to visit with great annotations along the way. Don’t be surprise to step on something and unearth a part of the amphorae or some other household good as it happened to us. But please, don’t remove anything from the site. Another fantastic day in Greece! By now, we’ve got a pretty good coverage of different places, epoques and Greek power-states. Tomorrow, we planned to spend time with the family and browse around Ioannina, a city built 900 years after the founding of Pella. 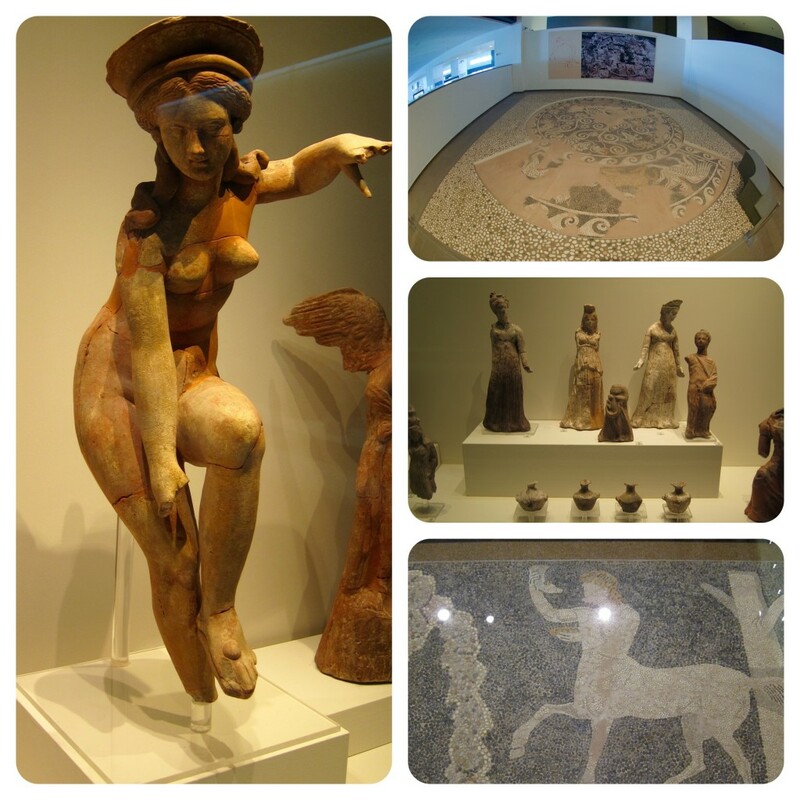 Pictures from Vergina and Pella. This entry was posted in Europe and tagged "Platonic" numbers, Abduction of Persephone, Aigai, Alexander the Great, Archelaus I, Archeological Museum of Pella, cemetery, city of goats, Euripides, Eurydice, Eurydike, Greece, Ioannina, Lonely Planet, Macedonia, Manolis Andronikos, Nicesipolis of Pherae, Pella, Perdiccas I, Philip II, Pythagorean golden triangle, Sanctuary of the Mother of the Gods, the Great Tumulus, The Royal Tombs, To Lemoni, tomb, Tumulus, Vergina, Vergina Sun. Bookmark the permalink.